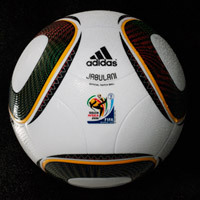 adidas and FIFA have today presented the adidas “JABULANI”, the Official Match Ball for the 2010 FIFA World Cup South Africa™, which has been developed in partnership with academics at Loughborough University. The “JABULANI”, which means “to celebrate” in isiZulu, features a South African inspired design and radically new technology. The new match ball, which was unveiled in Cape Town, will be available in retail outlets from December 5th onwards. Loughborough University were exclusive research partners for the adidas “JABULANI”, after previously developing the 2008 European Championship and 2006 World Cup footballs for adidas. The ball has already been tested and endorsed by a number of world-class international players, including Frank Lampard, Michael Ballack, Petr Cech and Kaka. The newly-developed “Grip’n’Groove” profile provides the best players in the world with a ball allowing an exceptionally stable flight and perfect grip under all conditions. Comprising only eight, completely new, thermally bonded 3-D panels, which for the first time are spherically moulded, the ball is perfectly round and even more accurate than ever before. The name ”JABULANI” originates from the Bantu language isiZulu, one of the eleven official languages of the Republic of South Africa, which is spoken by almost 25% of the population. Literally translated, “JABULANI” means “to celebrate”. Football is a passion that unites the world. The name of the new match ball appropriately pays tribute to the passionate football celebration international fans will enjoy in South Africa next summer. Eleven different colours are used in the adidas “JABULANI”, the eleventh adidas World Cup ball. These 11 colours represent the 11 players in every team, the 11 official languages of South Africa and the 11 South African tribes that make the country one of the most ethnologically diverse countries on the African continent. The colourful design brings together the tremendous diversity of the country in harmonious unity. Four triangle-shaped design elements on a white background lend the ball a unique appearance in African spirit. And like the outer facade of Johannesburg’s Soccer City Stadium, individual design elements also capture the colourfulness of South Africa. 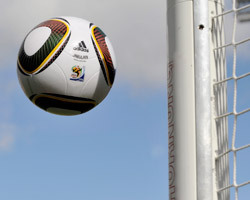 The Match Ball for the 2010 FIFA World Cup™ features a completely new, ground-breaking technology. Eight 3-D spherically formed EVA and TPU panels are moulded together, harmoniously enveloping the inner carcass. The result is an energetic unit combined with perfect roundness. Aero grooves create the clearly visible profile on the ball’s surface. The Grip’n’Groove profile circles round the entire ball in an optimal aerodynamic way. The integrated grooves provide unmatched flight characteristics, making this the most stable and most accurate adidas ball ever. The ground-breaking performance features of the adidas “JABULANI” have been confirmed in comprehensive comparison tests and checks in the wind tunnel at Loughborough University and the adidas football laboratory in Scheinfeld, Germany. Since the introduction of the “goose bumps” surface for the last European Championship ball, the microtexture of the new ball's outer skin has also been given a visible facelift. The “JABULANI” has a futuristic texture with fantastic grip, giving players full control over the ball in all weather conditions. adidas always involves world-class athletes in the development and testing of its products. For the adidas “JABULANI”, adidas partners AC Milan, FC Bayern München, the Orlando Pirates and Ajax Cape Town tested the ball in 2008, contributing to improvements in the surface structure and material composition. In the future, adidas will continue to use innovative technology to extend its world-leading position in football production and thus strengthen its position as the authentic symbol of high-performance sporting goods for professionals and amateurs alike. adidas also intends to unveil more revolutionary innovations in match ball production for future UEFA, FIFA and CAF competitions. The adidas innovation team (ait.) is already working on innovations for the 2014 FIFA World Cup Brazil™. Loughborough is one of the country’s leading universities, with an international reputation for excellence in teaching and research, strong links with industry, and unrivalled sporting achievement and its underpinning academic disciplines. It was awarded the coveted Sunday Times University of the Year 2008-09 title, and is consistently ranked in the top twenty of UK universities in national newspaper league tables. In the 2009 National Student Survey, Loughborough was voted one of the top five universities in the UK, and was named winner of the 2006, 2007 and 2008 Times Higher award for the UK’s Best Student Experience. In recognition of its contribution to the sector, the University has been awarded six Queen's Anniversary Prizes. It is a member of the esteemed 1994 Group – a set of internationally recognised, research-intensive universities – and has a reputation for the relevance of its work. Its degree programmes are highly regarded by professional institutions and businesses, and its graduates are consistently targeted by the UK’s top recruiters.